Welcome to Sweetie Pie’s is shutting its doors. Today, OWN announced the TV show will end with season five. The fifth and final season of Welcome to Sweetie Pie’s premieres on OWN with a special sneak preview on May 1st at 10 p.m. ET/PT. LOS ANGELES – OWN: Oprah Winfrey Network announced today its popular long-running docu-series “Welcome to Sweetie Pie’s” will premiere its fifth and final season with a special sneak preview on Tuesday, May 1 at 10 p.m. ET/PT (after Tyler Perry’s “The Haves and The Have Nots”). The series about the drama that comes with running a family-operated soul food empire, will continue in its regular time slot on Saturdays at 9 p.m. ET/PT beginning Saturday, May 5. The series, which originally debuted on OWN in October 2011, will celebrate its 100th episode finale on Saturday, June 9 at 9 p.m. ET/PT with a special 60-minute after-show immediately following the finale at 10 p.m. ET/PT. Hosted by comedian/actress Kym Whitley, the special will feature Miss Robbie, Tim, Charles, Monique, Jan, Linda and Cousin Michelle, as they share juicy stories and fun behind-the-scenes moments from the run of the entire series. Nothing in this family is off limits as they dish on the drama between Miss Robbie and Tim, family tensions, what the future holds for the family and more. What do you think? Have you seen Welcome to Sweetie Pie’s? Are you sad the show is ending? More about: OWN TV shows: canceled or renewed?, Welcome to Sweetie Pie's, Welcome to Sweetie Pie's: canceled or renewed? Love Thy Neighbor: Cancelled or Renewed for Season Five on OWN? Yes I’m very upset Wrlcome To Sweetie Pies is discontinuing. I’m from Memohis and I’m upset the restaurant didn’t open here! Memphis messed up m; big time! I wish the stories would reconsider and come back! One of the very best reality TV shows in years!!!! 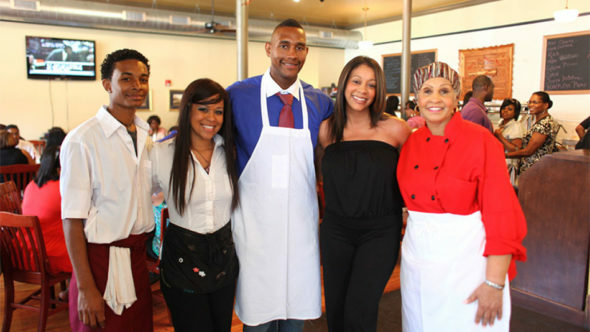 Why is sweetie pies being cancelled? This is a great show for the whole family. Oh my goodness, what can we do too get this show to continue?PLEASE PLEASE DON’T TAKE THIS SHOW OFF………. This is such a great show. I have been watching since the beginning and so sad it is ending. I would rather the Have and Have Nots end. It is not a positive uplifting show. I love Welcome To Sweetie Pies. Why is this the last season? It is such a good wholesome community show for everyone. Every family has crisis. So what! Please bring them back. Me and my wife love to watch Welcome to Sweetie Pie’s together. We want to thank Oprah, Ms Robbie, Tim, and the entire cast for giving us a good clean family show to watch. It shows that family can work together and help people on their way up. A piece of our hearts leaves with Sweetie Pies, but as we all know life must go on. We hope to see how they’re doing in the future. They will be surely missed. I am very disappointed the show is not coming back. Very sad! Excellent show.